Located in Huntingtown, Maryland, Holbrook Estates is a Builtrite Homes neighborhood. The neighborhood has 23 lots and is minutes away from local marinas, Breezy Point Beach, Chesapeake Beach, and local shopping and restaurants. Holbrook Estates is south of the Huntingtown Town Center off of Route 4. Just past Huntingtown Town Center on Route 4, make a right on Ponds Wood Road. Then make a left on Holbrook Lane and follow the road to the circle and turn left. Holbrook Estates is a single-family home community. The lots vary in size, from 3/4 to 3 acre homesites. At the time of construction the base models started around $380,000 and the square footage of the homes range from 1,442-2,646 ft. Most of the homes in the neighborhood have 4 bedrooms and 2.5 bathrooms. The bedroom and bathroom numbers may vary in size as all the models were customizable to the original homeowners’s wishes. Most of the Holbrook Estates homes have walkout basements and all include a 3 piece rough-in (full bathroom plumbing drain set-up). Other standard features include partial brick/stone front exteriors, gas fireplaces, security systems, 2 zoned heating/AC systems, a professional landscaping package, and 9ft ceilings on the first floor. Builtrite Home Developers is family owned and operated and has been building homes for over three decades. Builtrite works closely with homeowners to design unique and personalized dream homes for their customers. Personal attention and quality craftsmanship goes into every home built. The neighborhood is nestled in a wooded area about a mile from Huntingtown Town center and minutes from Prince Frederick Town Center with local shopping, restaurants, and services. Breezy Point Beach is about 5 miles away with a campground and marina. With a half mile of sandy beach, a 200-foot fishing and crabbing pier, a playground for children, a netted swimming area, volleyball, and picnic areas set up for grilling, Breezy Point provides is a great place for the whole family. The neighborhood does not have an HOA, and homeowners are free to make choices about their landscaping, parking, and home color palettes. The community is located in a quiet wooded neighborhood close to Route 4 South, but far enough away to not hear the highway traffic. The neighborhood street is a great country scenic path for jogging and riding bikes. 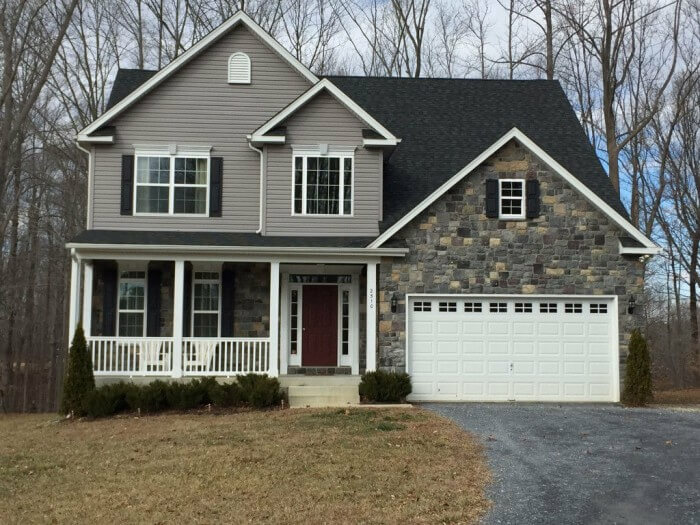 If you prefer a community without a HOA, good size family homes, convenient location to beaches, and award winning schools you’ll want to check out Holbrook Estates in Huntingtown, MD 20639!